As you can see, there is still some python code in the cython function. One of the limitations with cython, is that if I want to run the cython function from a python script, I need to return the results as a python object. Of course, I could just run everything in cython! 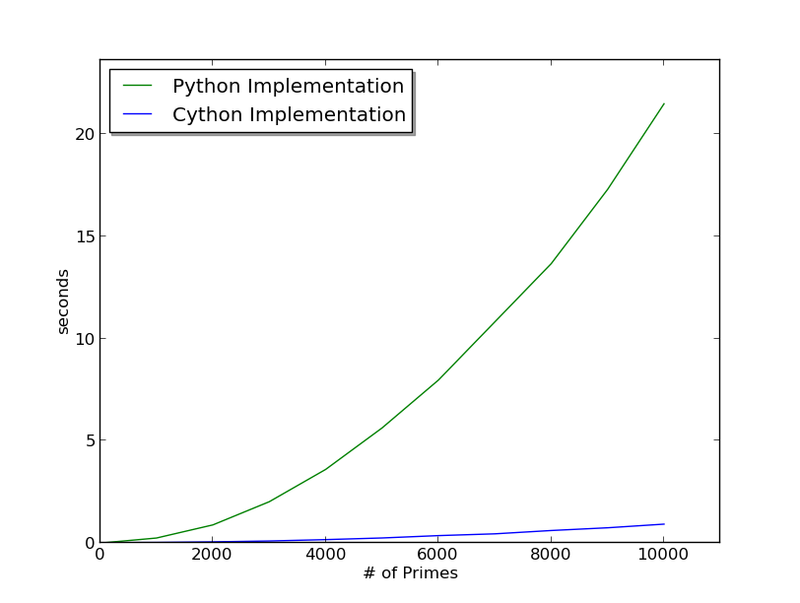 So as you can see, the partial cython implementation vastly outperforms the python function. This gives you an idea of what kind of overhead the python interpreter brings to the language. So know that I have a good idea of what kind of performance gains I can get using cython, I am going to try to implement some of these in my algorithms. From what I understand, I simply need to convert python data objects to cython data types in order to get the code to compile to C. I think a fun future project would be to write a python script that automatically converts common python data objects to their corresponding cython counterparts. If I get a little time in the near future I may give that a shot. This entry was posted in Cython, github, matplotlib, optimization, Python on August 16, 2013 by admin.